Today, I need to take a moment to rail against one of the most reliably entertaining and beloved of museum attractions – fossil sandboxes. These activities are nearly ubiquitous at paleontology-related parks and museums, and some of them can be quite large and elaborate. There are a few variations, but they generally involve children using simple hand tools to dig through sand or loose gravel to uncover planted fossils (usually replicas, but I’ve seen a few places sacrifice real Pleistocene bones for this activity). 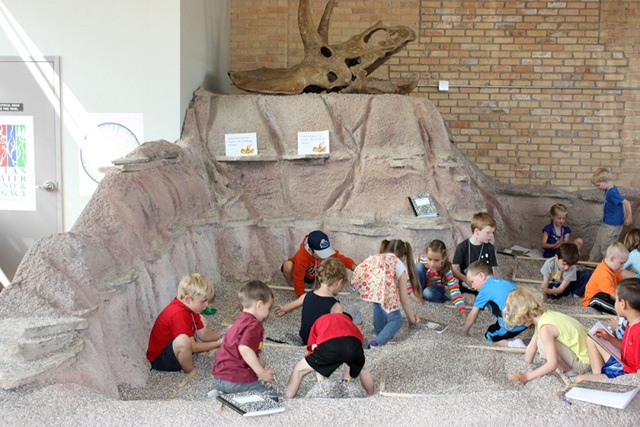 Kids and families absolutely adore fossil sandboxes, and they generate all kinds of goodwill for the museums that feature them. In fact, many visitors have come to expect sandbox digs at paleontology exhibits, and become annoyed when one isn’t available. I understand the appeal of sandboxes. For kids, they’re an opportunity to play pretend, engage in a physical activity after a day of looking at stuff, and generally have fun making a mess. Museum educators, myself included, are all about Gardner’s theory of multiple intelligences – the idea that different people learn best in different ways. While some easily absorb and retain information by reading or listening quietly, others prefer to solve a problem, talk through a topic with others, or engage in some sort of hands-on activity. That last one is called bodily-kinesthetic intelligence, and it is common among athletes and actors, among others. A fossil sandbox allegedly provides an activity for bodily-kinesthetic learners to develop and hone a physical skill related to the topic at hand. Kids get a chance to see and feel what it’s like to be a real paleontologist working in the field. Except not really. A sandbox focuses kids’ attention, but that’s not the same thing as learning. What they’re doing has virtually nothing to do with actual paleontology. Digging is a comparatively minor part of field work – far more time is spent prospecting for fossils. When a team does start excavating, it’s conducted in a precise and organized manner, so that no taphonomic data is lost. By comparison, the sandbox arrangement conjures ideas of frantic treasure hunting, rather than piecing together and interpreting clues about past life. Furthermore, digging through loose sand is exceedingly rare in the field. If it were so easy to get at fossils, they would either have been found already or would have eroded away to nothing. A simulation is supposed to model a real event, or constrain that event to a limited set of variables. Sandbox digs do neither. Parents and caretakers might appreciate a place where kids can entertain themselves for a while, and educators can pat themselves on the back for providing a physically-involved experience. But there’s no use pretending that anybody is learning in what amounts to a themed playpen. One alternative to the sandbox concept is provided by Thistle. He describes an activity in which he sets up a series of square meter “dig sites” within a room. Different specimens or artifacts are placed in each square. Participating students are then told that each square represents what was found in a layer of excavation, and are prompted to draw conclusions based on the different objects recovered from different strata. Students consider the spatial relationships among found objects, and discuss the roles of taphonomy and deep time. Unlike a sandbox dig, the results of this activity are comparable to those of a real excavation, and students are asking the same sorts of questions paleontologists would. Granted, Thistle’s activity requires much more guidance than a sandbox, but it’s a good example of something that participants might actually learn from. The point is, we owe our audiences more than a mindless diversion with no bearing on actual science. And for that matter, we owe the scientists whose work we’re communicating more than a tacky, inaccurate simulation. If our goals are to inspire enthusiasm for science and to encourage young visitors to think scientifically, surely we can do better than a sandbox dig. Thistle, P.C. 2012. Archaeology Excavation Simulation: Correcting the Emphasis. Journal of Museum Education 37:2:65-76. After I posted my slightly critical evaluation of the AMNH fossil halls last month, a reader suggested I take a look at Next of Kin by Lowell Dingus. Dr. Dingus was the project director for the 1995 renovation, and his book chronicles the decade-long process of overhauling these genre-defining exhibits. 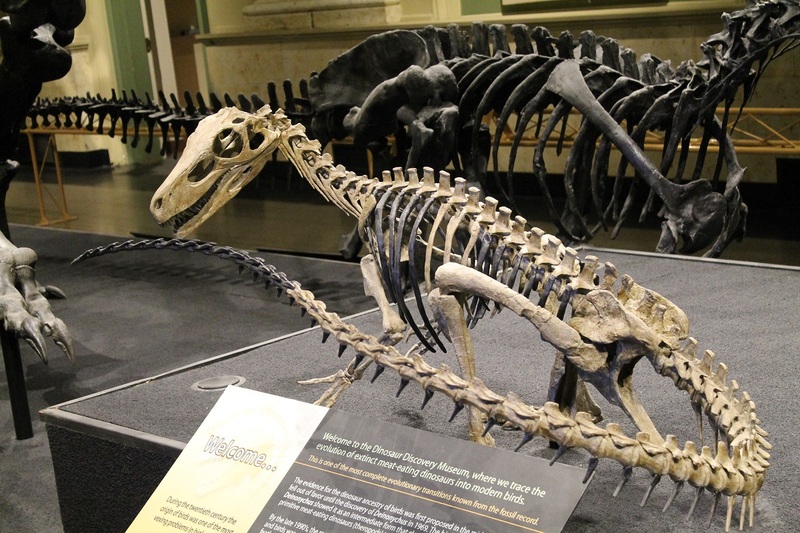 It also includes plenty of gorgeous photos of the AMNH fossil exhibits past and present. Although out of print, Next of Kin can be found online for next to nothing. If you find anything on this blog interesting, I would call this book required reading. I cannot recommend it enough. 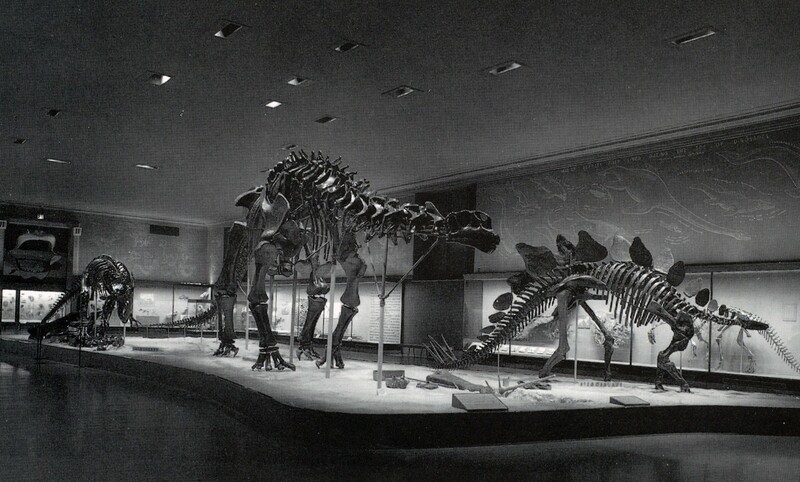 Edwin Colbert designed this version of the Jurassic exhibit in 1956. This space is now the Hall of Saurichian Dinosaurs. Photo from Dingus 1996. Next of Kin is full of fascinating information about the renovation, and the history of the halls in general. For instance, it was news to me that the original plan in 1987 was to modernize only the two fossil mammal halls. 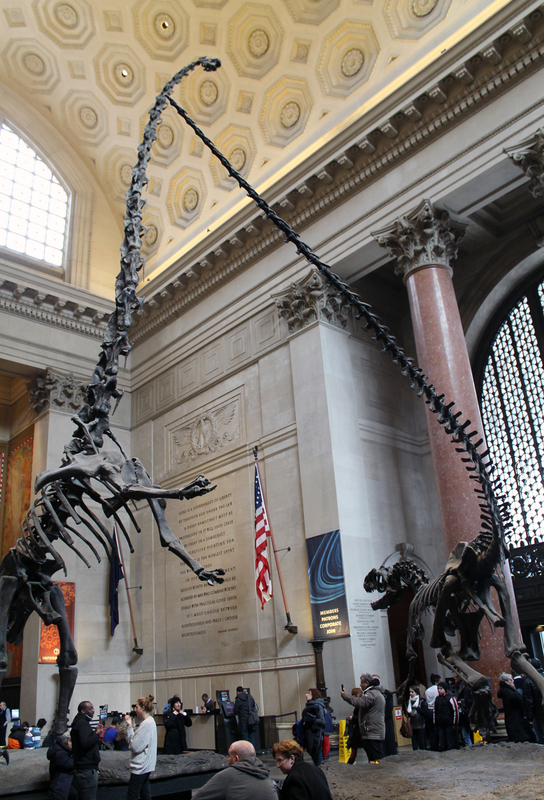 When William Moynihan took over as Director of AMNH the following year, however, he asked in a planning meeting why the dinosaur exhibits weren’t being renovated, and soon the project expanded to include all six halls on the 4th floor. Apparently the approaches to interpretation, aesthetics, and layout that characterize the exhibits today were already fully formed. The concept of a main pathway with branching alcoves representing individual clades was in place, so the exhibit team only needed to set the starting point back a ways to include the dinosaurs and the rest of the vertebrate family tree. Restoring the historic interior architecture, obscured since the 1950s, was also an early priority. Dingus relates how he wanted to eliminate the “black box” look of the midcentury exhibits and let natural light back into the halls. 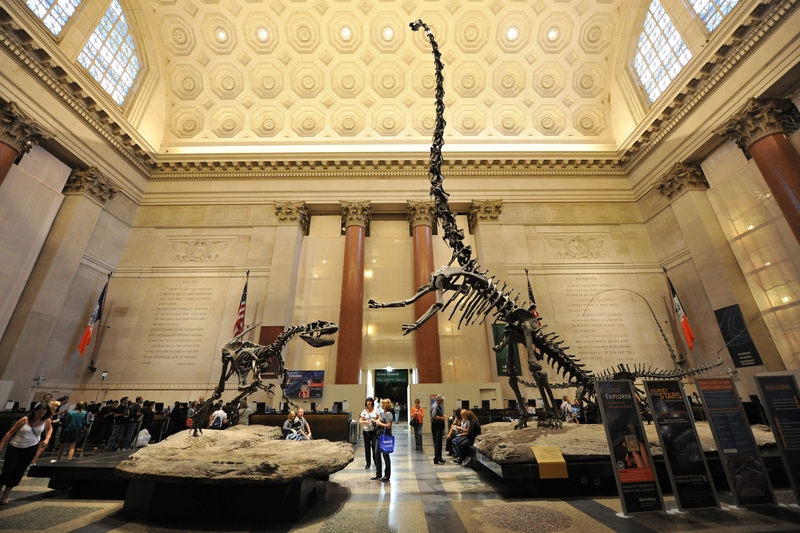 In my opinion, the well-lit, airy aesthetic is one of the standout features of the AMNH fossil halls, and one other museums might do well to emulate. Dingus also points out a number of clever design choices that I missed during my last visit to the museum. For instance, the primate section was deliberately placed in the center of the mammal hall, to avoid the implications of directed evolution and human superiority that once marked the AMNH exhibits. Another cool feature is the use of minimalist metal armatures to suggest the size and shape of animals for which only limited material is available. This is an artful way to convey the dimensions of these species without resorting to fabricating most of the skeleton. Again, this is something I’d love to see more of at other museums. Minimalist armatures suggest the size and shape of incomplete specimens. Photo by the author. Still, I was most interested in reading Dingus’s rationale for the design and layout of the AMNH fossil halls. In my previous post, I argued that the phylogenetic arrangement was a worthwhile experiment, but in practice it may not be the most practical way to make the history of life meaningful to the museum’s primary audience. More than any other organizational scheme, phylogeny is the way biologists think about the natural world, and I applaud the effort to encourage visitors to look at fossils the way scientists do. However, even the most basic elements of evolutionary classification are specialized knowledge, and require a daunting amount of up-front explanation (especially when targeting multiple age groups). I don’t think this integrates well with the multi-entrance, non-linear exhibit space at AMNH. 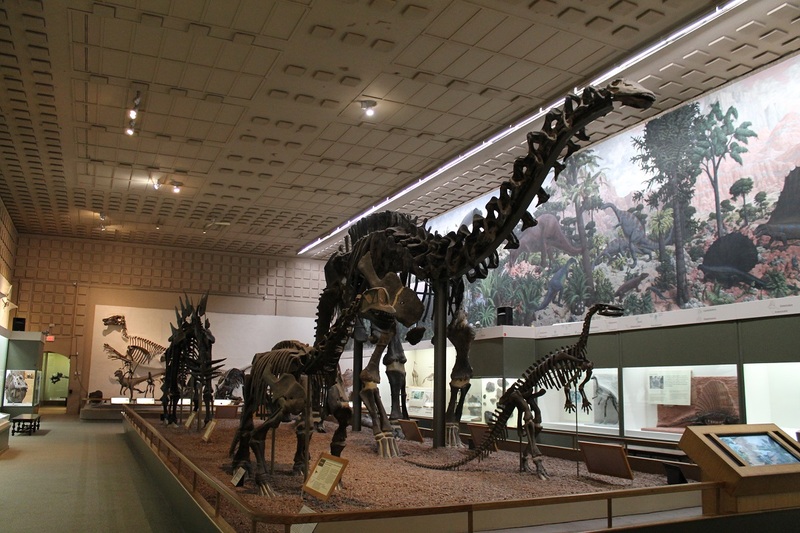 During the initial planning stages of the AMNH renovation, Dingus and other staff toured several large-scale paleontology exhibits in North America and Europe. Dingus clearly did not like what he saw, lamenting that “some institutions rely heavily on easy-to-understand, anecdotal labels and robotic recreations of dinosaurs that appeal to the lowest common denominator of visitor intellect.” He rejected the “prominent contemporary school of exhibit design that advocates only giving the visitor what he or she asks for,” feeling strongly that his institution could do better. Referring to the renovation as a “scientific crusade,” Dingus was inspired to challenge his audience in a way that peer institutions did not. Dingus and his colleagues wanted to show visitors the real science behind paleontological reconstructions. The phylogeny-based arrangement was central to that goal, emphasizing rigorous anatomical analysis and empiricism in a field historically characterized by idle speculation. The orientation hall is in the oldest of the 4th floor exhibit spaces. Until the 1960s, this space was occupied by the Hall of the Age of Man. Photo from Dingus 1996. I agree wholeheartedly with all of this. There was a period in the 80s and 90s (I think the worst is behind us) when the trend toward visitor-focused, educational exhibits got mixed up with a push to make museums more competitive with other leisure activities. Customer enjoyment was valued above all else, even if it meant sacrificing the informative content and access to real specimens that made museums worthwhile institutions in the first place. The resulting displays were filled with paltry nonsense like simulators, pointless computer terminals, and the aforementioned robot dinosaurs*. These exhibits imitated amusement parks, but with only a fraction of the budget they quickly fell into disrepair and technological obsolescence. Despite being museums’ most important and unique resources, curators and research staff found themselves increasingly divorced from their institutions’ public faces. *Fine, I admit robot dinosaurs are cool. But I’d prefer that they weren’t in museums. Under these circumstances, a backlash is quite understandable. Nevertheless, it is a common mistake (which I am by no means accusing Dingus of making!) that a visitor-centered exhibit is the same as a frivolous one. When educators push for audience-focused exhibits, they have the same goal as curators: to communicate as much content as possible. Audience-focused exhibits aren’t about dumbing down or eliminating content. They’re about presenting content in a way that effectively reaches the museum’s diverse audience. The AMNH fossil halls would work well for an informed adult visitor with ample time to inspect every specimen and read every label. But this is not the typical audience for natural history museums, and unless AMNH is a major outlier, it’s not the core audience for these exhibits. Most visitors come in mixed-aged groups. The trip to the museum is a social experience, and interactions occur among visitors as much as they occur between visitors and the exhibits. The best museums anticipate and meet the needs of these visitors in order to provide a quality learning experience. An updated version of the classic (and classically misleading) horse evolution exhibit. Photo by the author. It’s admittedly fun to share horror stories about dumb comments overheard in museums. Who in this field hasn’t rolled their eyes at the parent who makes up an answer to their child’s question, when the correct information is on the sign right in front of them? And yet, some of the blame for this failed educational encounter should fall on the museum. Why was that parent unable to spot the relevant information with a quick glace? Can we design signage so that the most important information is legible on the move, or from across the room? Can we correct commonly misunderstood concepts in intuitive ways? As Dingus argues, it’s important to aim high in the amount of information we want to convey. There’s nothing worse than a condescending teacher. But a carefully-honed message in common language will always be more successful than a textbook on the wall. Happily, this is the way the wind is blowing these days. In a strong reversal of the situation a decade ago, curators now work closely with educators on the front lines to produce exhibits that are both accessible and intellectually challenging. It’s been 20 years since AMNH opened the latest version of its fossil exhibits…perhaps a new and even better iteration is already on its way! Dingus, L. (1996). 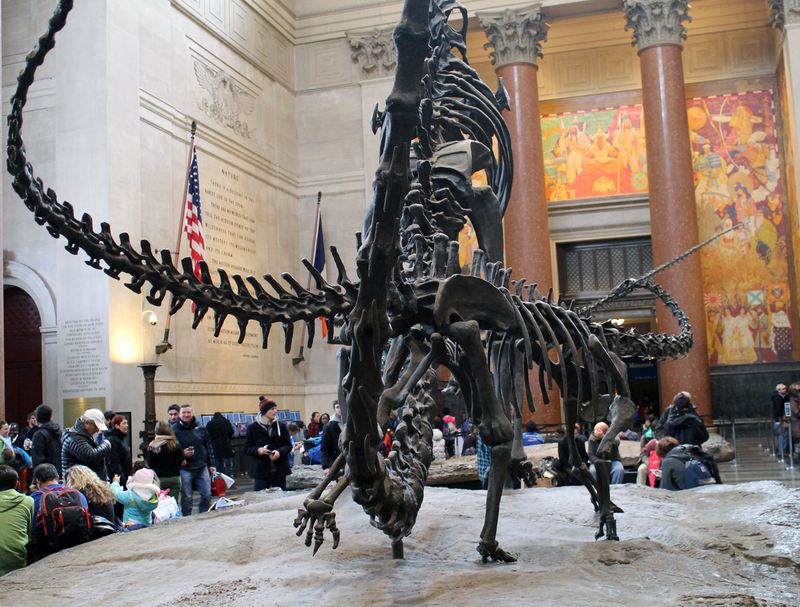 Next of Kin: Great Fossils at the American Museum of Natural History. New York, NY: Rizzoli International Publications, Inc.
Half a year ago, I promised a series of posts comparing the common strategies for framing the history of life in museum exhibits. This post is the first step toward making good on that goal. 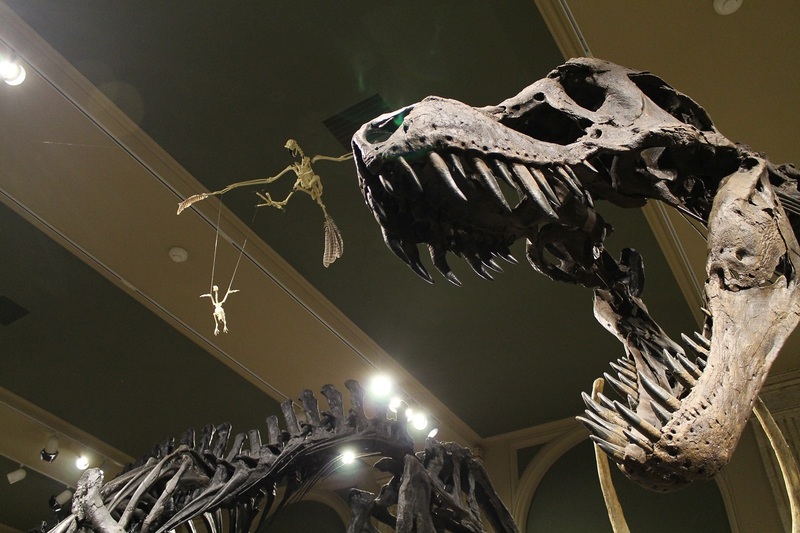 Historically, fossil displays at major natural history museums amounted to little more than dinosaur pageant shows, and even today this is all many visitors want or expect. The challenge for exhibit designers is to contextualize the fossils as part of a greater narrative without being alienating, overwhelming, or perhaps worst of all, condescending. A large, permanent exhibit is a enormously time-consuming and expensive undertaking. The opportunity to build or thoroughly renovate an exhibit might occur only once in a generation, so there is exceptional pressure to produce something that succeeds and endures. Exhibits tend to be products of their time, however, and are strongly influenced both by contemporary scholarship and trends in museum theory. One of the most enduring formats for exploring the fossil record is the “walk through time.” A chronological portrayal of the history of life is an obvious solution, and I don’t mean that in a disparaging way. Audiences are predisposed to understand the forward progression of time, so little up-front explanation is needed. It also helps that the geological timescale compartmentalizes the history of Earth into tidy units. Each Era, Period, or Epoch has a unique cast of characters and a few defining events that make it easy to sum up. 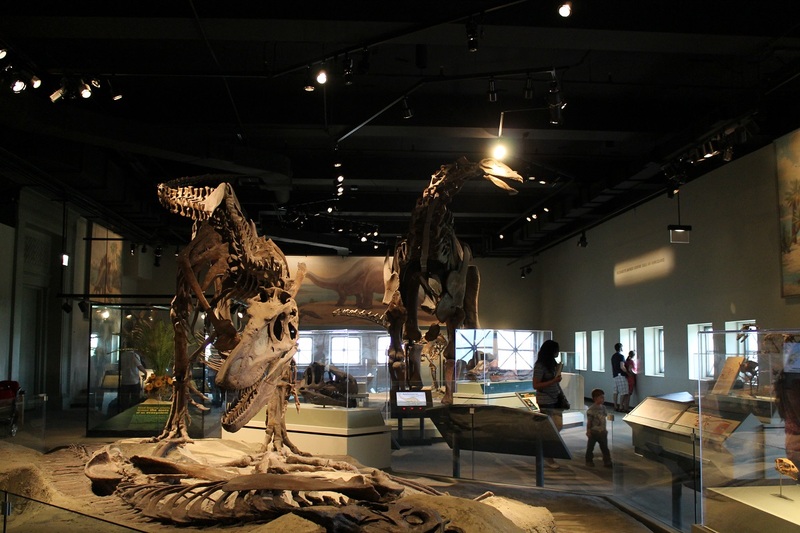 There are plenty of examples of chronological fossil exhibits, including “Prehistoric Journey” at the Denver Museum of Nature and Science, the 1980s iteration of the National Museum of Natural History fossil hall, and even traveling exhibits like Ultimate Dinosaurs. 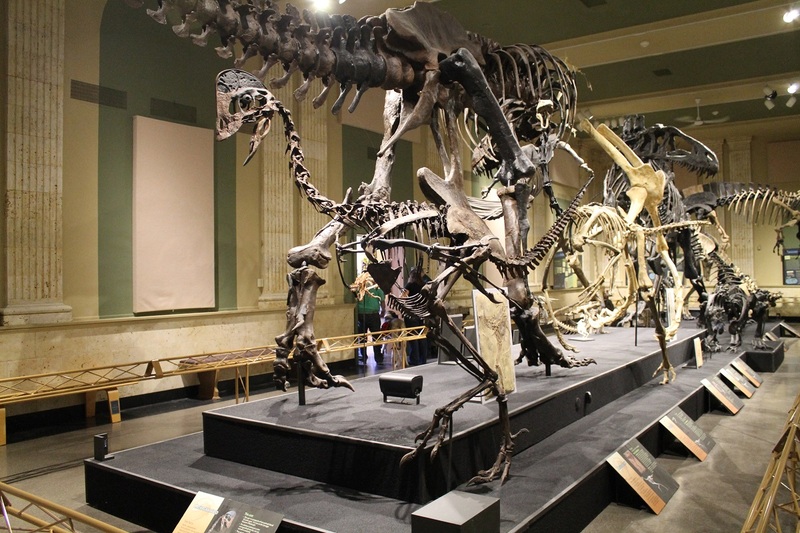 For this post, though, I’ll be using the Field Museum of Natural History’s “Evolving Planet” as my primary case study, since it so thoroughly embraces the “walk through time” format (and I have a good set of photos on hand to jog my memory). Evolving Planet is a 27,000 sq. ft. journey through the evolution of life. It opened in 2006, although it is notable that Evolving Planet relies heavily on the structure of the previous paleontology exhibit, “Life Over Time.” Major set pieces like the replicated Carboniferous coal swamp and the Apatosaurus mount remained in place while exhibit designers overhauled the aesthetics and narrative. The most important change is the explicit focus on evolution. Although evolution is key to all biological sciences and the evidence for it is overwhelming, many schools in the United States fail to teach evolution properly and at least a third of the population rejects it outright. As destinations for life-long learning, museums are well-poised to address this deficit in evolutionary understanding, and the Field Museum has enthusiastically risen to the occasion. Evolving Earth weaves the evidence for evolution into all aspects of the displays. The first thing visitors see is the thesis of the exhibit – everything that has ever lived is connected through and is the result of evolution – printed on an otherwise blank wall. 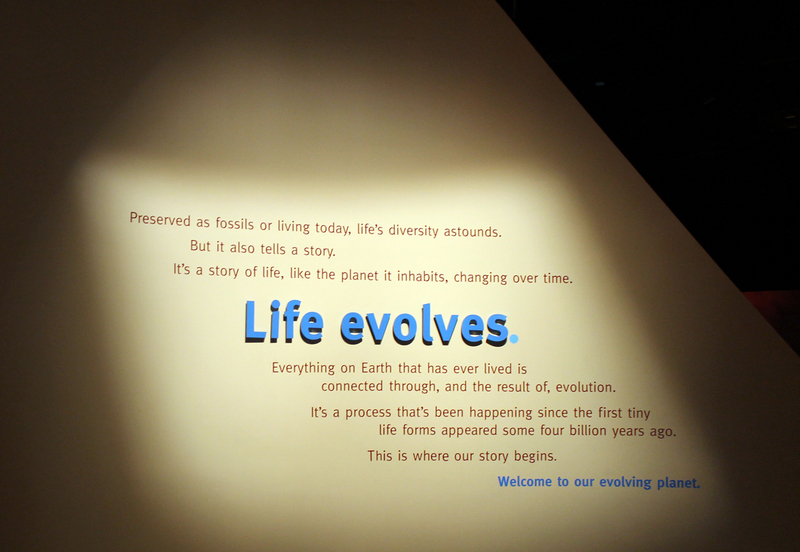 Moving forward, visitors learn how evolution via natural selection works, and how we know. Along the way, common misconceptions, such as the idea that lineages improve over time, or that evolution is “just a theory”, are proactively addressed and corrected. The thesis of Evolving Planet cannot be missed. Photo by the author. This pedagogical approach defines a trend in exhibit design that began in earnest in the 1950s. 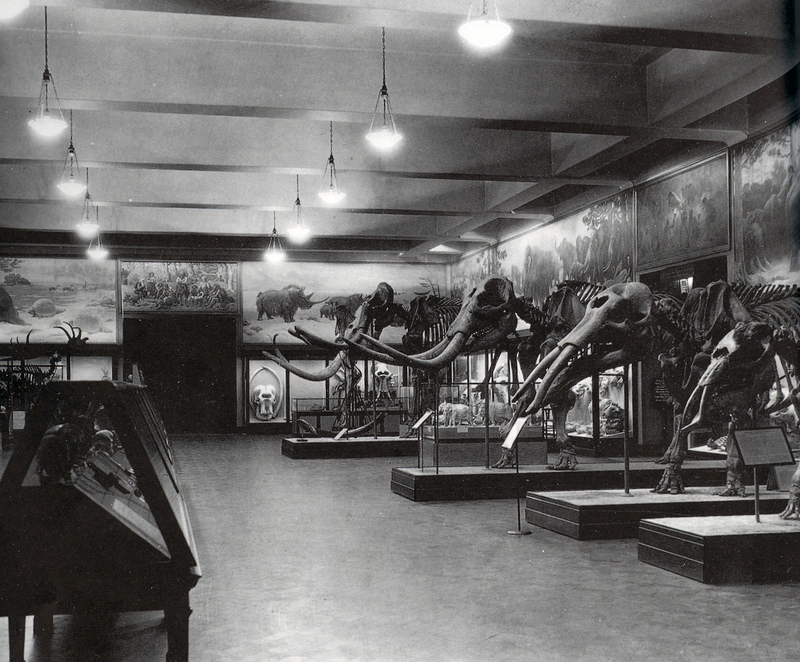 Early natural history exhibits were designed by and for experts, combining expansive collections of carefully arranged specimens with a few “iconic” displays, such as dinosaur skeletons or taxidermy mounts. By the mid-20th century, however, visitor-centric ideas had begun to take root. Designers began to envision the routes visitors would travel through an exhibit space, and consider what they would look at first when entering a room, and why. Soon hierarchical signage (main ideas in big text, working down to sub-topics and specimen labels) became the norm. Exhibits were enriched with interpretive displays, like dioramas, and scholarly labels were replaced by conversational text and even multimedia. By the 1970s, most of the exhibit responsibilities once held by curators were now handled by exhibit designers and educators. No longer places to explore a collection and view objects at will, exhibits now had carefully structured narratives built around explicit educational goals. In the 80s and 90s, the very floorplans of new exhibits came to reflect this identity, as open halls were replaced with carefully directed switch-backing corridors. Each geological time period in Evolving Planet is color-coded. Photo by the author. Once we reach the Permian, the fossils can start to speak for themselves. Photo by the author. Evolving Planet is, for better or worse, thoroughly rooted in the late 20th century tradition of exhibit design. As the map above shows, once visitors enter Evolving Planet, they are committed to a lengthy trek along a predetermined route. There are no shortcuts to the dinosaurs – you must traverse the entire history of life, starting with its origins in the Precambrian. Along the way, you’ll become familiar with the exhibit’s iconography. 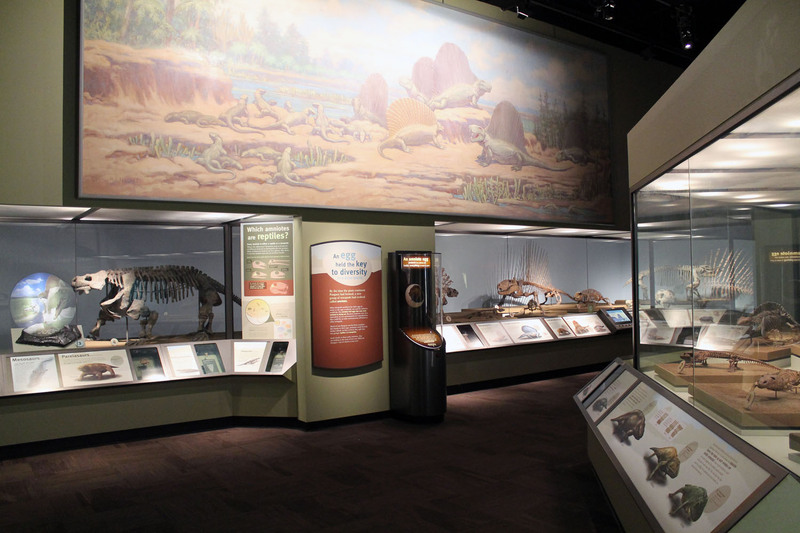 Every time you enter a new geologic period, you are greeted by a “Timeline Moment.” These include a chapter heading, a (difficult to photograph) back-lit illustration, an update of where you are on the timeline, and a summation of the key evolutionary innovations and environmental changes of that age. All the walls and signs in each section are also color-coded, making your progression to each new period very distinct. It’s sometimes a little simplistic, but it’s a drastic improvement over the silly weather report-style videos that served the same function in Life Through Time. * Finally, the path is occasionally interrupted by unmissable black and red signage indicating that a mass extinction has occurred. The resulting experience feels like walking through a book. Information is relayed in a specific order, and visitors are expected to recall concepts that were introduced in previous sections. *1990s exhibits were often characterized by over-the-top silliness. We’ve backpedaled a bit since, having learned that it’s possible to be engaging without bad puns and dated pop culture references. A panoramic CGI recreation of the Burgess Shale fauna brings small, easily overlooked fossils to life. Photo by the author. One challenge inherent to a chronological narrative of the history of life is that the physical evidence for early organisms simply isn’t very interesting to look at (for non-specialists, anyway). Large mounted skeletons of fossil vertebrates have a lot of presence, but they same can’t be said for stromatolites and wiggly-worm impressions. The designers of Evolving Planet address this problem in two ways. First, they built iconic contextual displays to stand in for fossils that aren’t suitably monumental on their own. The Cambrian section features a panoramic video showing the Burgess shale environment recreated in CGI. Actual fossils are available, but the video is what makes visitors stop and take note. Likewise, the Carboniferous section is dominated by a walk-through diorama of a coal swamp, complete with life-sized giant millipedes and dragonflies. Like the predetermined pathway, these landmark displays are very much in keeping with late 20th century trends in exhibit design. It’s a conceptually odd but admittedly effective reversal of the classic museum: fabricated displays are supported by genuine specimens, instead of the other way around. Mass extinction markers tell visitors to expect something different up ahead. Photo by the author. The second strategy concerns the layout of Evolving Planet, which was inherited from the previous exhibit, Life Over Time. 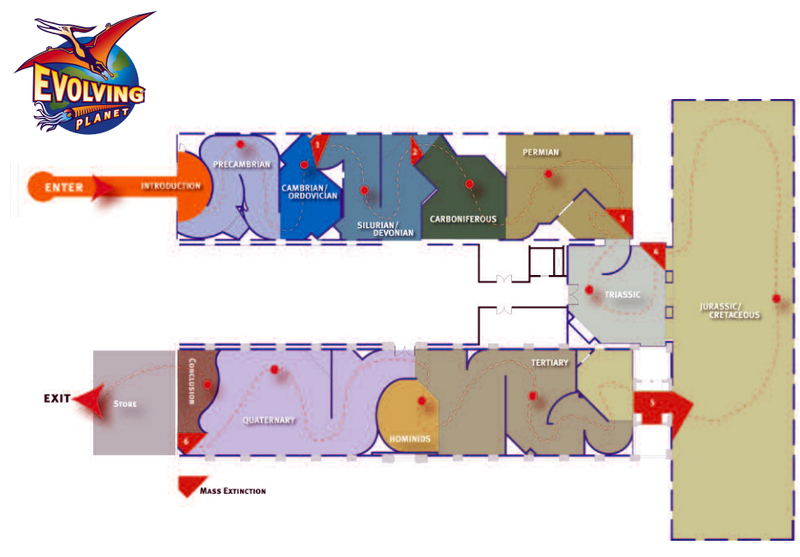 The space is shaped like a U, with switch-backing corridors flanking a more open dinosaur section in the middle. Curator Eric Gyllenhaal explained that “the heavy content, on the stuff that people were not familiar with, was the stuff that came first and came afterward, and that’s where we really got into the details of the evolutionary process” (quoted in Asma, pp. 226-227). 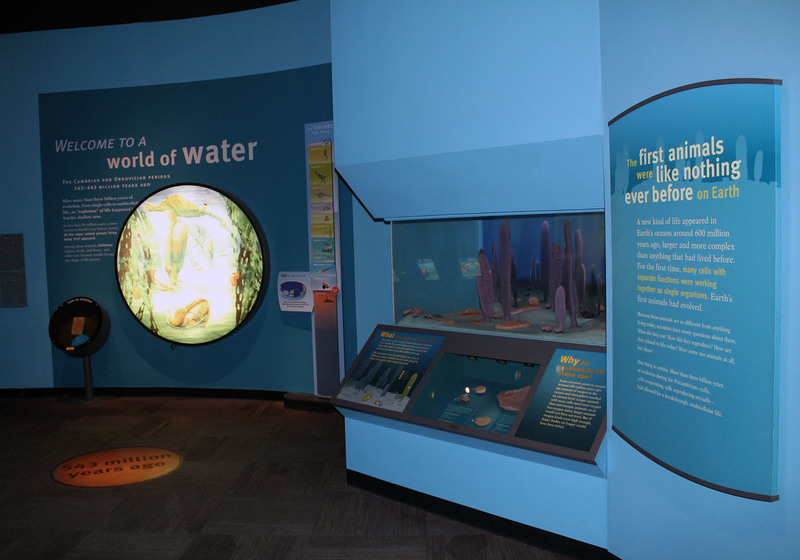 Visitors are more focused and more inclined to read signs carefully early in the exhibit, so the designers used the introductory rooms to cover challenging concepts like the origins of life and the mechanisms of speciation. This is the “homework” part of the exhibit, and the narrow corridors and limited sightlines keep visitors engaged with the content, without being tempted to run ahead. Once visitors reach the Mesozoic and the dinosaurs, however, the space opens up. Among the dinosaur mounts, visitors are can choose what they wish to view, and in what order. This serves as a reward for putting up with the challenging material up front. The path tightens up again on the way out, but it’s not as pedagogically rigorous as the beginning of the exhibit. Some sections, like the human evolution displays, are actually cul-du-sacs that can be bypassed by visitors anxious to leave. Although the dinosaurs get a third of the exhibit to themselves, the hall still struggles to contain them. Photo by the author. The story of human evolution is relegated to a cul-de-sac late in the exhibit. Photo by the author. Evolving Planet’s chronological narrative and linear structure complement each other nicely. 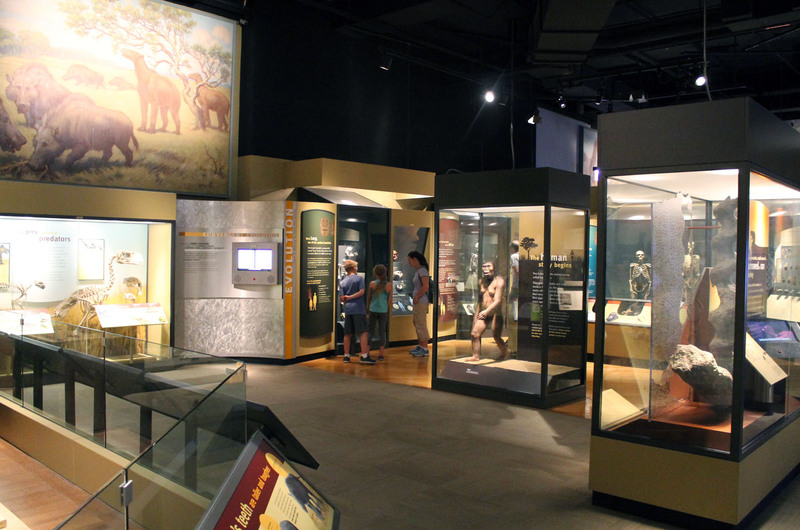 The sequential path gives the exhibit designers significant control over the visitor’s learning experience, and when dealing with widely misunderstood concepts like evolution, the benefits are clear. The exhibit establishes clear learning goals, and designers can be reasonably confident that these goals are being met. Based on the other new permanent exhibitions at the Field Museum, I get the impression that the design team strongly favors linear exhibits. 2008’s “Ancient Americas”, for instance, closely mirrors Evolving Planet’s structure: a set path through a series of themed spaces, unified by consistent iconography. The designers are to be commended for absolutely owning this concept, and realizing it to its full potential. Exhibit designers deliberately made the path to the exit much more obvious in the final stretch of Evolving Planet. Photo by the author. The problem with a linear design, of course, is that it’s constraining. All visitors enter with prior knowledge and a certain worldview or perspective, and are inclined to be more interested in some displays than others. Linear exhibits largely suppress this by forcing everyone through the same tube. Ironically, the strong emphasis on the sequence of geological time periods may also overstate their importance. While these divisions are defined based on real events like extinctions and faunal turnover, they are still human constructs with often messy borders. Relying too heavily on them understates the importance of long-term, short-term, and localized evolutionary events. Museums should be educational, and exhibits should challenge visitors, particularly regarding the mechanisms of evolution and the scope and complexity of deep time. Still, there’s something to be said for free choice in elective education. Evolving Planet, and “walk through time” exhibits in general, skews more toward the former. It’s an effective option, but also a safe one. Next time, we’ll take a look at exhibits that frame paleontological science in less intuitive ways. Asma, S.T. 2001. Stuffed Animals and Pickled Heads: The Culture and Evolution of Natural History Museums. New York, NY: Oxford University Press. Diamond, J. and Evans, E.M. 2007. “Museums Teach Evolution.” Society for the Study of Evolution 61:6:1500-1506. 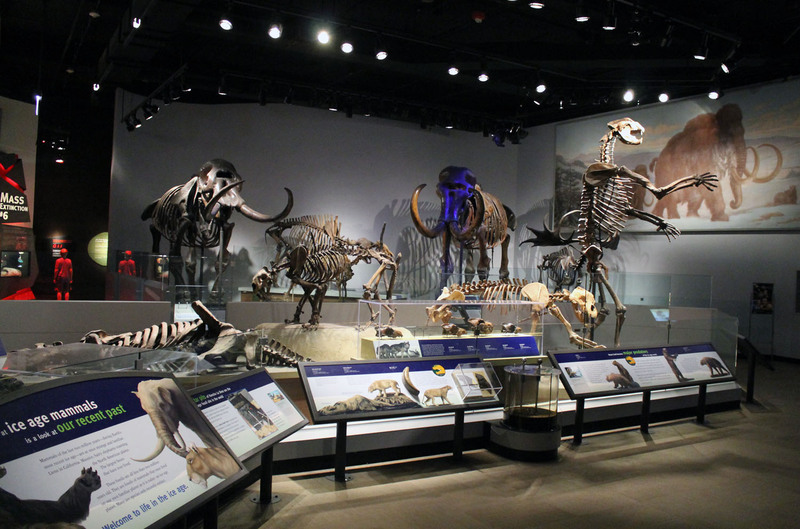 This post started out as a review of “Evolving Planet”, the expansive paleontology exhibit at the Field Museum of Natural History. The short version is that it’s very good exhibit constrained by a somewhat frustrating layout. We’ll get back to that eventually, but first it’s worth considering the purpose of large-scale fossil exhibits in a more general sense. 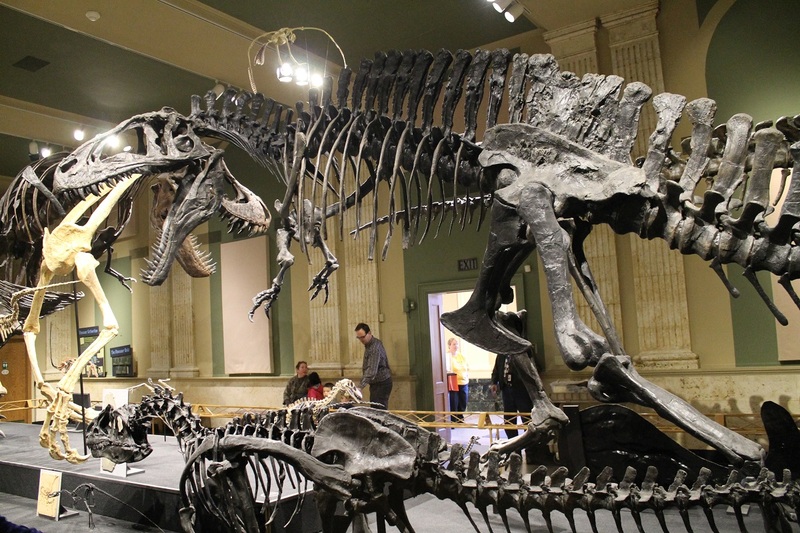 Fossils, particularly the mounted skeletons of dinosaurs and other prehistoric animals, have been central to the identity of natural history museums since the late 19th century. 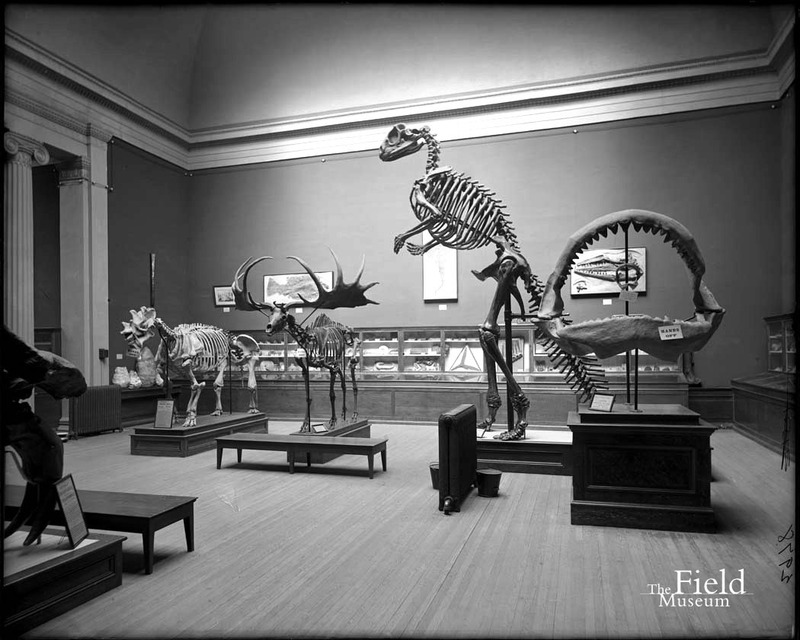 In the early days, public exhibits were afterthoughts to the primary work of the museum (research and curation of collections), and if there was any logic behind their layout, it was an aesthetic logic. 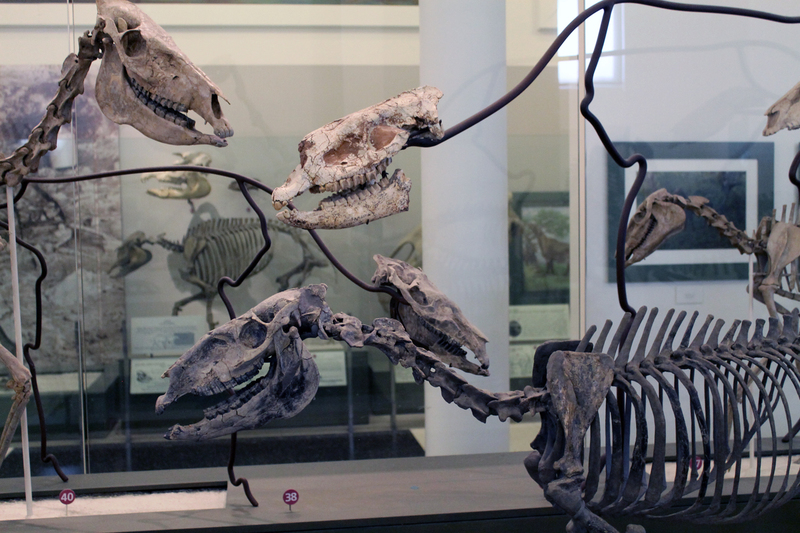 Typically posed in neutral, trophy-like stances on centrally-situated pedestals, mounted skeletons were the highlights of a natural history display for most visitors. 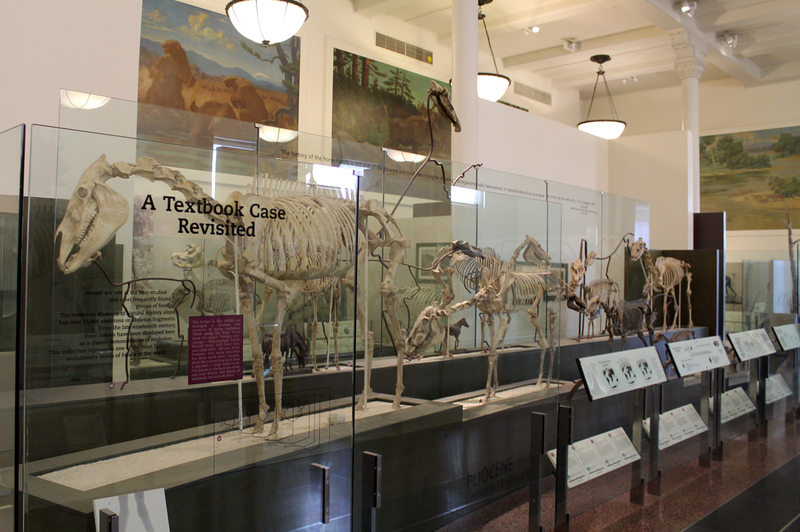 For anyone not trained in comparative anatomy, however, these exhibits ultimately amounted to prehistoric pageantry. People could marvel at the great size of the animals, but there was very little to be learned besides the names of the species in question. A typically random assortment of fossil specimens at the Field Colombian Museum, ca. 1898. Image courtesy of the Field Museum Photo Archives. These days, we try to do better. Exhibits are designed with a clear narrative structure, as well as specific learning goals for the audience. 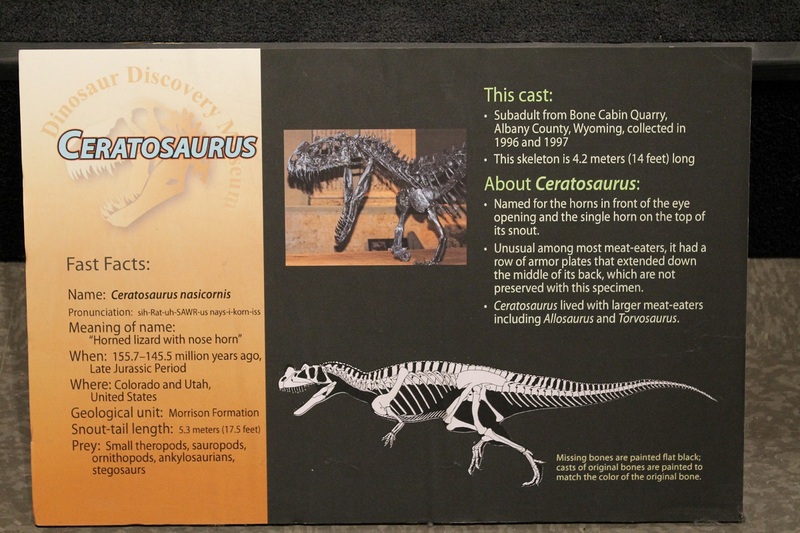 The focus of the narrative varies depending on the exhibit and the team behind it, but most modern natural history exhibits are explicitly designed to answer “how” as well as “what.” For paleontology displays, this means telling the story of life on Earth while also communicating how scientists collect and interpret evidence to put that story together. Crafting an exhibit has been compared to writing a popular nonfiction book, except designers are using the three-dimensional space of the exhibition hall as their medium. In this way, modern exhibits are more about ideas than specimens, or at least, the specimens are present primarily to illustrate the major scientific principles being communicated. That’s how it works on paper, anyway. Despite this focus on education (and institutional mandates to provide learning opportunities for the widest possible audience), visitor surveys show that dinosaur pageantry is still the default mode of understanding for the majority of people passing through paleontology exhibits. No matter how carefully we craft our stories, most visitors still leave these displays recalling little more than a list of cool specimens they saw. Dinosaur pageantry has its place and can be employed for good. Dinosaurs and other prehistoric animals are undeniably impressive and spectacular, and it is absolutely worth taking advantage of that fact. 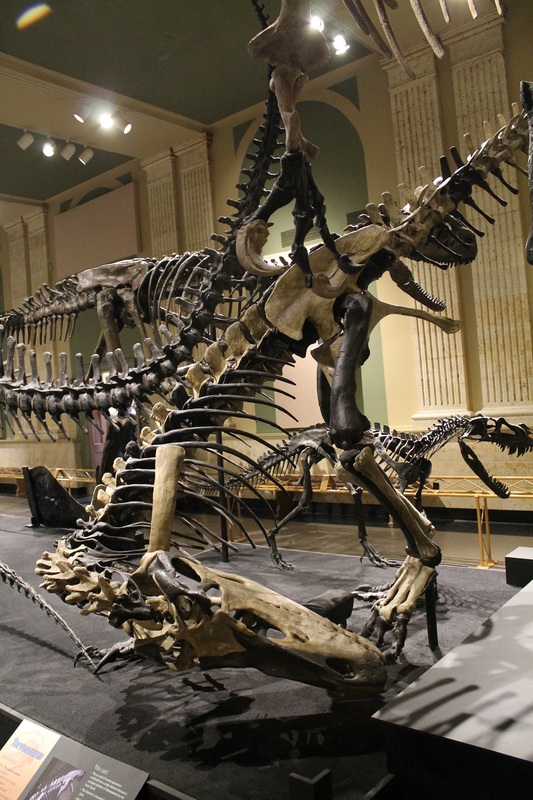 We want people to pay attention to science, and in that respect mounted skeletons of favorite dinosaurs are great ambassadors to the world of research and discovery. The challenge is getting past the attention-grabbing stage. Prior experience has led visitors to expect that dinosaur pageantry is all paleontology has to offer, and many seem unprepared or unwilling to commit to a deeper understanding. The great hall at the Peabody Museum of Natural History, one of the last unmodified early 20th century fossil displays in the US. Photo by the author. So are these people just hopeless rubes? Should exhibits be tailored only to visitors that care enough to put in the effort to understand? It should go without saying that this condescending attitude is completely wrongheaded and goes against the very spirit of museums. Education is half about knowing your content and half about knowing your audience. If visitors are not picking up on the content as desired, then a reassessment of who those visitors are is in order. Many museum exhibits still seem to be pitched at interested adults traveling alone with all the time in the world. This is a good description of many of my museum visits, but I’m also part of an increasingly small fraction of museum visitors. Most people who come to natural history museums come in groups of friends or family, and these groups often represent a range of ages. What’s more, most visitor interactions while in the museum will not be with the exhibits, but with each other. For the typical visitor, the museum experience is primarily a social one. With this demographic in mind, a textbook on the wall (or a long video lecture*) is the last thing natural history museum audiences need. Visitors are absorbing exhibit content while simultaneously navigating a complicated, unfamiliar space. In the case of parents, they are also monitoring the attention span, hunger, and bathroom needs of their charges. Caught up in this whirlwind of information, visitors frequently fall back on what they already know. In the case of paleontology exhibits, this often means identifying familiar dinosaurs and ignoring the more intellectually challenging contextual information. *It’s worth pointing out that a long video is NOT an improvement over a long label. Transferring label copy to a video or computer terminal does not inherently make the exhibit more interactive or more interesting. In fact, when the disruptive noise and need to wait for the next showing are taken into account, poorly implemented multimedia is probably less useful than traditional text labels. The challenge for exhibit design, then, is dealing with the fact that visitors are not passively ingesting information. Visitors passing through an exhibit pull out relevant pieces of information and filter them through the lens of their existing worldview. Exhibit designers want visitors to also learn new information and challenge their preconceptions, but it’s easy to go too far. Survey after survey has shown that visitors do not appreciate exhibits that force them to move (or think) on rails. For practical reasons noted above, few visitors are able to look at every display, watch every orientation video, and work through every interactive in the prescribed order. Visitors need flexibility in order to make the exhibit experience their own. Finding the balance between providing informative context and providing a customizable experience is quite challenging, and not every exhibit succeeds. 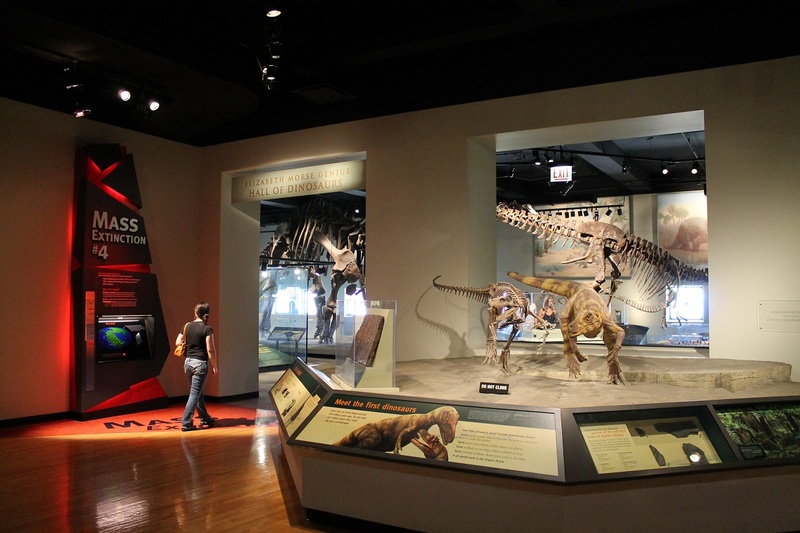 The dinosaur hall in “Evolving Planet” at the Field Museum. Photo by the author. On top of that, paleontology exhibits are particularly difficult to design because of problems with relatability. The story of life on Earth is immense, complex, and frequently counter-intuitive. It’s not enough to just explain what happened, we have to explain the history and methodologies of the half-dozen scientific disciplines that have contributed to to our understanding of that narrative. Even something so basic as the numerical age of a given fossil taxon requires a deluge of explanation to convey how we know. And all of this needs to be conveyed concisely, without being alienating, overwhelming, or condescending. Most importantly, it has to be made relevant to what audiences already know and understand. 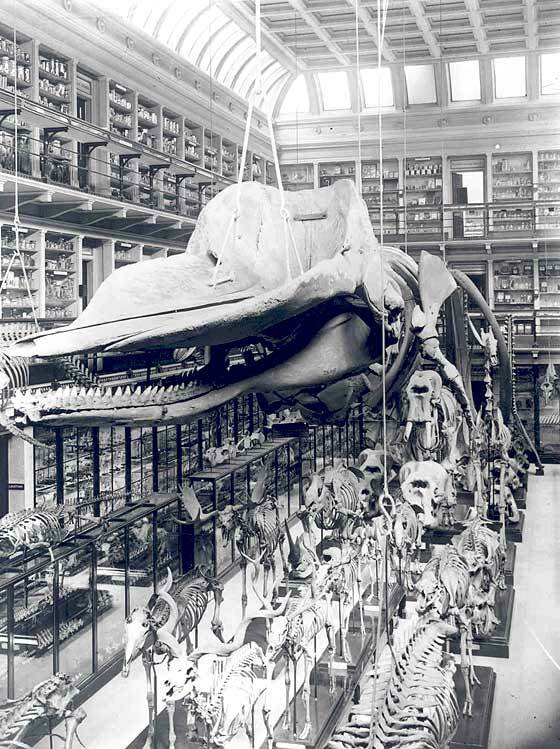 Over the years, major natural history museums have attempted a variety of organizational strategies for their fossil exhibits. Each of these has been an attempt to break the dinosaur pageantry barrier and to portray the true complexity and relevance of paleontological science. Some arrangements, like taxonomical organization, have generally fallen out of favor. Others, like chronological presentations of life through time, are reliable mainstays that have been re-imagined in varied ways at different institutions. Still others, including cross-sections of specific extinct ecosystems, biogeography, and environmental change over time are relatively new and untested. Keeping everything in this meandering introduction in mind, the upcoming series of posts will explore the strengths and weaknesses of each approach from the perspectives of science communication, aesthetics, and for lack of a better term, hospitality for non-expert audiences. Stay tuned! Falk, J.H. and Dierking, L.D. 1992. The Museum Experience. Washington, DC: Whalesback Books. Wands, S., Donnis, E. and Wilkening, S. 2010. “Do Guided Tours and Technology Drive Visitors Away?” History News 93:8:21-23. As a museum* educator, I work with two kinds of experts: researchers who create knowledge and education specialists who disseminate knowledge. Both groups have ostensibly the same mission, which is to effectively communicate credible information about the world around us. Generally, both sides collaborate effectively, due in no small part to a shared enthusiasm for their work. But there is one issue (that has been raging for decades) in which researchers and educators frequently seem to be shouting past each other, complaining about what one another are doing wrong but not making much progress in reconciling their priorities. This issue is, of course, “new museum” exhibit aesthetics, the trend toward replacing traditional academically-oriented displays of specimens with dynamic, interactive leaning experiences that use specimens alongside interactive activities and multimedia to communicate specific educational messages to a broad audience. *When I say museum, I mean natural history or science museum. Art museums are a completely different beast, and one I won’t pretend to understand. From the perspective of many researchers and certain sets of museum-goers, these newer exhibits are frivolous lowest-common-denominator attractions better suited to amusement parks than serious institutions. For example, in a recent Tetrapod Zoology review of the London Natural History Museum’s Extinction exhibit, Darren Naish criticizes computer-based interactive exhibits because they “take up space that really should be spent on something far more worthwhile” and “give visitors the excuse to do the same old crap they do every other day of their lives (look at screens, play videogames, use touchscreens) when they really could be treated to a more unique experience.” Likewise, an all-encompassing rant about new museums can be found in this (admittedly 6 year old) post by Matt Wedel, which is well worth a read (seriously, read it now and then come back to this). The Hunterian Museum as it appeared in the 1800s: ALL OF THE SPECIMENS. But in direct contrast to Wedel’s insistence that the intrinsic value of real specimens is all museum-goers want or need, there are editorials like this one by James Durston, which I will charitably describe as provocative. Durston tells us that museums that only display artifacts for their own sake are “classrooms made of cold granite, the only sense of life emerging from the tourists.” He argues that most objects on display in museums don’t matter as much to visitors as museum workers think they do, and pleads for more context and more reason to care. So what’s the deal? Are modern museums too focused on providing context for their collections, or not focused enough? Let me begin by explaining why modern museum exhibits look the way they do. A century ago, or even 50 years ago, exhibits were arranged and labels were written almost exclusively by expert curators. These exhibits were, by and large, created with an audience of “interested people” in mind, meaning either other experts or clientele with enough leisure time to learn the jargon presented to them. The majority of visitors who came through the door were not directly catered to, because exhibits were considered an afterthought to the real work of the museum: research and collections management. In the past 30 years, however, the museum field has decided that it can do better. Museums shifted from inwardly focused, primarily academic institutions into focal points for lifelong learning that operate in service to a wide community of visitors. Go to the website of your favorite museum and check out their mission statement (it should be pretty easy to find). I just did, and the mission of the National Museum of Natural History is to “increase knowledge and inspire learning about nature and culture, through outstanding research, collections, exhibitions, and education, in support of a sustainable future.” Note that the museum doesn’t seek to increase knowledge and inspire learning just for a core audience of studious, well-read people, but for everyone. That means the museum needs to offer content that is interesting to all sorts of people, whether they learn best by reading and absorbing information, by physically doing something, by making choices for themselves or by discussing an issue with others. Preserving and studying collections is no less important than in museums of yore, but these activities are understood to be in service of providing knowledge to the widest possible audience. This shift in focus has inspired museum exhibits with more explicit educational goals, as well as attempts to create learning experiences that reach visitors other than those already keyed in to the customary language of academia. Drawing heavily on Gardner’s multiple intelligences, modern exhibits are intended to cater to diverse audiences that learn in a variety of different ways. In particular, hands-on mini experiments and computer-based games have become staples in science exhibits in order to reach visitors who learn better by doing than by observing. These interactive elements (we just call them interactives in the biz) are not appealing to everyone, but museums serve a broad community and have no business being exclusionary in the services they provide. Beyond any moral or educational imperative, however, modern museums must be accessible because they are nonprofit institutions that rely heavily on public funds. They are funded based on the promise that they will provide educational resources for their communities, and that means serving more than a small subset of the population. Furthermore, ever-tightening budgets mean that museums need to be strictly managed. Educators have no choice but to establish clear standards of success for their exhibits, and to develop means to track attendance and audience engagement. Just to keep our jobs and keep museum doors open, we need to be able to clearly articulate who we are serving, how we are benefiting them and how we know. 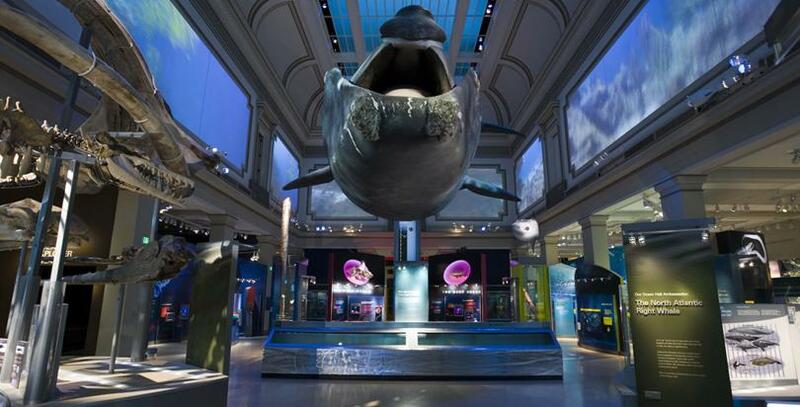 The new Ocean Hall at NMNH: a $50 million new museum extravaganza. If it was not clear, I absolutely agree with the goals behind new museum design. As was argued in the American Alliance of Museums’ 1984 “Museums for a New Century” commission report, “if collections are the heart of museums, what we have come to call education – the commitment to presenting objects and ideas an an informative and stimulating way – is the spirit.” General audiences can certainly experience awe and wonder when presented with neat stuff, but museums can and should provide more than that. A hundred birds from around the world look impressive on a shelf, but they are much more interesting when the viewer understands the evolutionary processes and biogeography that produced such diversity. A little bit of context goes a long way to making such an exhibit is accessible and valuable to the widest possible audience. In practice, however, I will concede that many attempts at broadening the appeal of natural history exhibits are pretty bad. Some modern museum exhibits use technology in terrible ways, and many attempts to increase interactivity are bafflingly pointless or even counterproductive. For instance, a dinosaur exhibit I visited earlier this year includes a green-screen stage where visitors can place themselves in a scene with dinosaurs running around. The result is not only painfully dated, but it has no educational purpose and may well encourage people to think that humans and dinosaurs once co-existed. Likewise, an exhibit on human evolution features a glorified photo booth that makes visitors’ faces look like other hominids. This non-educational attraction is consistently the most popular element of the gallery, distracting visitors from the fantastic displays and specimens all around it. 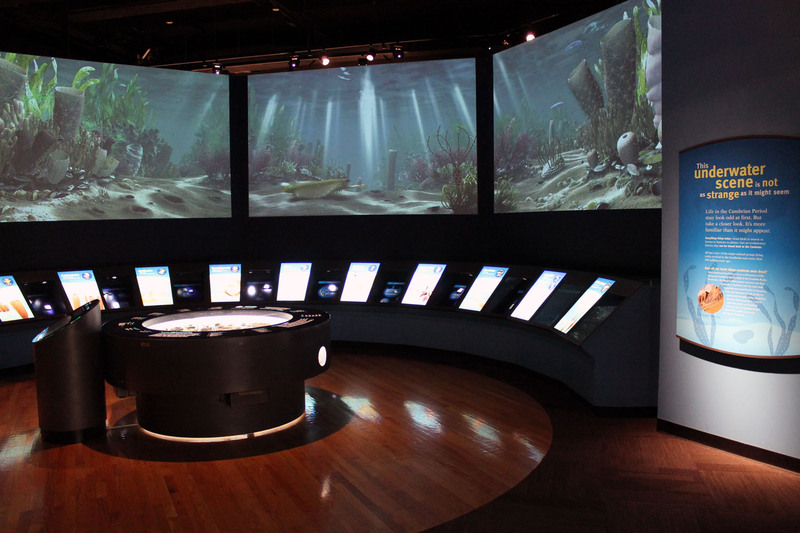 More generally, an increasing number of exhibits are incorporating profoundly pointless touch-screen computers that let visitors browse photos of the specimens on display right in front of them. Just because an exhibit element is hands-on doesn’t mean it is actually helping visitors interact with exhibit content. One reason lousy interactives keep being designed is that our evaluation procedures* are not always great at separating good exhibits from appealing ones. A good interactive provides informative content in an engaging way, while an appealing one is engaging but lacking in content. Many visitors may speak highly of just-appealing interactives, but that doesn’t mean these belong in museums. The aforementioned budget woes are also a factor here: interactives that draw crowds for any reason are a big help when scrounging for ways to fund research and preservation. There are tough calls to make when deciding between what visitors most want to see and what is actually worthy of an educational institution. There are no easy answers, especially when museums are consistently hurting for funding. *Do note, however, that actually testing whether exhibits are meeting their educational goals has finally become commonplace…for far too long museum workers just assumed anything they made was good enough. Nevertheless, when an interactive display works, when visitors’ eyes light up with understanding by working out a scientific problem for themselves, the process is absolutely worthwhile. Earlier this year, I raved about the low-tech brilliance of an activity in the Academy of Natural Sciences that let visitors physically act out the difference in upright and sprawling gaits. And the NMNH Human Origins exhibit features a fantastic computer game where visitors play the part of a future world leader and experience firsthand the challenges and consequences of overpopulation, food shortage and invasive species. Exhibit interactives, both technology-based and otherwise, are difficult to pull off, and many museums have failed at the task. But we owe it to our visitors to try.